Members from INDEVCO plants in Lebanon - Unipak, MASTERPAK, Sanita and Unipak Tissue Mill - participate in the Five S (5S) training. Corrugated manufacturing plant Unipak held Five S (5S) seminar sessions for 290 employees from Unipak, MASTERPAK, Sanita and Unipak Tissue Mill, from 25 May - 6 June 2009. The 5S workshop, which stands for sort, set in order, shine, standardize and sustain, provided instructions on the 5S principles, as well as practical application in operations. 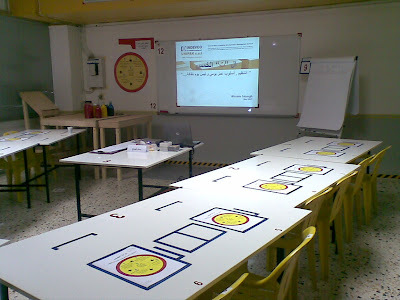 The seminar area featured signs and indications made according to the 5S standard. 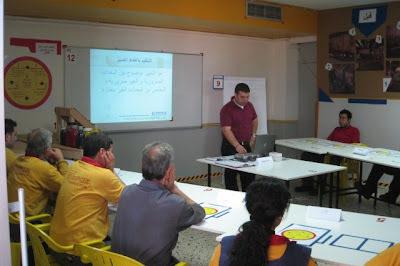 The objective of this program is to train employees on visual order, organization, cleanliness and standardization. We strive to improve efficiency and safety at INDEVCO Group manufacturing plants. Visual Factory Management is one of the systems we adopt for improving productivity, safety, quality, on-time delivery, profits and employee morale and make working areas user friendly. Toyota, global motor manufacturer, set five principles for assuring an organized work area. These principles are good housekeeping practices which can have a major impact on any organization. The principles have also been referred to as the five keys to a total quality environment. Phase 1: Sorting: Going through all the tools, materials, etc., in the plant and work area and keeping only essential items. Everything else is stored or discarded. Phase 2: Straighten or Set in Order: Focuses on efficiency. When we translate this to "Straighten or Set in Order", it sounds like more sorting or sweeping, but the intent is to arrange the tools, equipment and parts in a manner that promotes work flow. Phase 3: Sweeping or Shining or Cleanliness: Systematic Cleaning or the need to keep the workplace clean as well as neat. Phase 4: Standardizing: Standardized work practices or operating in a consistent and standardized fashion.